After making the Night Mode feature available for its iOS and Android apps, Twitter has now rolled it out to its desktop site. 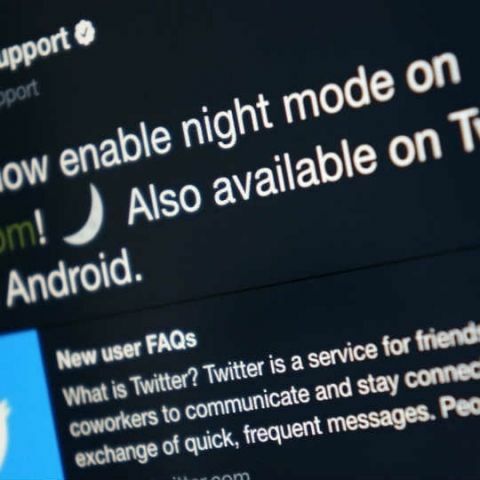 Already available on iPhone and Android apps, Twitter has now rolled out its dark-toned "Night Mode" interface theme to desktop users that will help users monitor key real-time information without straining the eyes. "You can now enable night mode on https://twitter.com. Also available on Twitter for iOS and Android," a post on the microblogging website said on Wednesday. The "Night Mode" look is dark navy colour and not black or gray, which is considered as a better choice for general legibility. According to Tech Crunch, the feature might not be immediately available to everyone, but if it is, users can enable it by clicking on own icon in the top right corner of the Twitter web interface and tapping that 'Night mode' toggle at the bottom of the menu. Twitter added zero users since first quarter, posting $574 million in revenue in the second quarter this year which is a decrease of five per cent YoY (year-on-year). Last quarter, the micro-blogging platform had daily active usage growth of 14 per cent YoY. Twitter now has 328 million monthly active users (MAUs) -- the same number it reported in the first quarter of 2017. How Often Should I Charge My desktop\'s Battery to Prolong Its Lifespan?